We’ve taken our members’ love affair with attention-enhancing beverages to a whole new level! 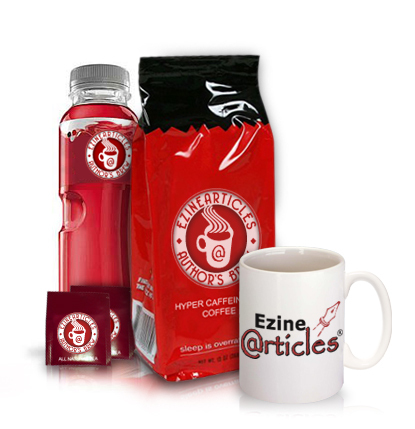 For over a decade, EzineArticles Expert Authors have extolled the virtues of coffee, tea and other “high-octane” beverages for their ability to significantly enhance the creativity and productivity of those who partake. This passion for caffeine soon became such an iconic representation of the article writing and marketing subculture that several years ago we felt compelled to add mugs and coffee to our lineup of promotional items. Before long, our mugs, and the beverages they held, became a recognized symbol of achievement for thousands of Expert Authors around the world. Eventually, this highly-caffeinated undercurrent became so pervasive that it flowed right into the very look and feel of the entire EzineArticles experience on our Facebook Fan Page, our Twitter Profile Page, our YouTube Channel and even in this Blog! So it should come as no surprise that we’re taking the next logical step into the realm of productivity-enhancing refreshment. Introducing: Author’s Brew. Enhanced with pure Peruvian coffee extract and concentrated Ginseng, Author’s Brew is guaranteed to help you write and submit more high-quality, original articles than ever before. One 8-ounce serving has the same motivational power as an entire pot of French Roast coffee … without all the time-consuming bodily side-effects of drinking such large quantities of fluid. Plus it tastes GREAT! Remember: More Author’s Brew = More High-Quality Articles = More Laser-Targeted Traffic = More Conversions … not to mention increased credibility and exposure for you! Whether you prefer coffee, tea or chilled energy drinks, Author’s Brew has the right beverage for you! Watch this blog tomorrow for more information on how you can have Author’s Brew delivered right to your home. In the meantime, grab a mug of whatever you have on-hand and take a good, long sip. Smile when you realize that it’s the last time you’ll be drinking an inferior attention-enhancing beverage. Then get back to writing and submitting another set of high-quality, original articles. And leave a comment – we’d love to hear your thoughts on Author’s Brew. As a many of you surmised, Author’s Brew is nothing more than a product of some over-caffeinated imaginations. However, in an ironic twist of fate, we’ve realized that there’s a lot of potential in the Author’s Brew idea (especially the coffee). So we’ve already begun working with our coffee vendor to produce a custom, high-octane blend of coffees packaged under our own label. We intend to call it … Author’s Brew (of course). Watch this Blog and our Twitter stream for more details soon. Sounds great!! How do I get some?? Great. But what are the details? How many articles, we need to submit to get this? No details are needed. It’s not a contest, just a new product we’re introducing as gifts and for purchase. Watch the blog tomorrow for more details on how to get yours. One billion, I suppose! Articles brewing! Good thoughts for April 1! No fooling! Anyway, what happened to the cartoon contest? Long time, no fun! You’re right, it has been some time since the last cartoon contest. But we’ve had a lot of other more important things to tell you about – like new products, features, videos, templates, changes … sigh … only so many posts in the week. Hmmm… Maybe we’ll do one soon as a weekend post. This was my favorite in my inbox this morning. BRING IT ON. My Red Bull habit costs 3x as much as my Premium Membership! I sure hope there will be an affiliate program. And please keep the Citric Acid to a minimum. It really makes my Reflux flare-up. The packaging alone makes me want to purchase. I think the bottom of the coffee says, “Sleep is overrated”…love it! Congratulations, Donna. You’re one of the few who picked up on this and made it public. But surprisingly the joke may be on us and life may end up imitating art … watch for more details. I know all you coffee afficionados think the coffee bean is the best way to ingest your caffine. Since the April Fool’s joke has turned, I vote for a nice spicy chai tea. I put it in my @EzineArticles mug every morning … and now I’ll have two more mugs to choose from! Your request has been duly noted. Just goes to show how, Responsible, we are to those who trust and love us! You, Ezinearticle folks are topdog!!!! now you got me. nice idea. how about one java chip frap, here..venti!! Author’s brew sounds good. Personally, I’d actually prefer a lower octane version, eiven a decaf option. Ideally, it also should be available espresso ground. and good luck to me too! Good one.I am waiting to buy it. Bring it soon!